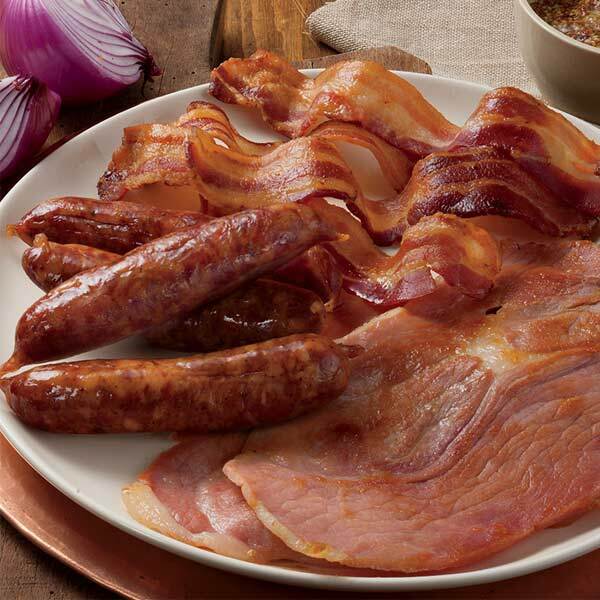 What we like to call the "Big Three," the most popular, best-selling smokehouse meats. We start with 12 oz. of old-fashioned, hickory-smoked Sausage Links. Add 12 oz. sliced, hickory-smoked Country Bacon. And to top off this trio of American meats: 12 ounces of the classic Uncooked Country Ham Slices. All ready to sizzle and serve at a down-home breakfast, or any meal of the day. Ingredients: Pork, salt, water, red pepper, sage, black pepper, sugar, sodium nitrite, natural hog casing. Storage: Refrigerate upon arrival. If not to be used within 28 days, freeze for up to 6 months. If the vacuum seal is broken while under refrigeration, the ham will need to be used within a week or frozen. Cooking: Parboil over medium heat in a skillet with 1/8 cup water in the bottom of a frying pan. If you like, add a little brown sugar to the surface of the ham slices, the last minute of frying. Avoid overcooking, as this will cause the ham to be tough. Cook over medium heat until lightly brown. Red Eye Gravy: Remove fried ham to a platter. To pan drippings, add ¾ cup water or water mixed with coffee. Bring to a boil and serve with the ham.